Keeping fit: it’s not rocket science, is it? Yet for most us it can feel that way at one point or another. Just like computers or finance, fitness can be so full of jargon that sometimes trainers seem to start speaking another language. We’re talking about those long, technical terms and barely pronounceable buzzwords that leave you noddingalong, thinking, “What? I thought I was just jogging.” For now, don’t worry about the “biophysical this” and “dynamic that”. 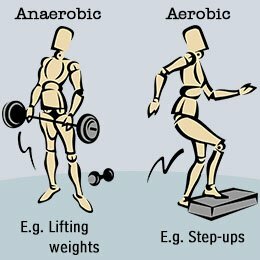 First, you need to understand the two most common terms used by fitness experts: aerobic and anaerobic. It’s often saidthattomaximiseperformance,youneedtodo amixtureofaerobicandanaerobictraining.This is true to an extent, but the kind of training you need to do always depends on your goals. Put simply, aerobic means “with oxygen”. If you exercise aerobically, oxygen is used to break down your body’s supply of glucose and turn it into energy. The by-products of this are carbon dioxide,whichyoubreatheout,andwater,which iswhyyousweatwhenexercising. Aerobic exercise burns calories fairly comfortably, making it essential for weight loss. It is good for increasing circulation and stamina, and reducing blood pressure and cholesterol. It also releases lovely feel-good chemicals that give you a high afterwards. Aerobic exercise tendstobe more social than anaerobic (largely because you cantalk), so it’s a healthy way of seeing friends. How to do it: Aerobic exercise is any kind of exercise that you do continuously for a while, such as fast walking, jogging (although not for some beginners), gentle swimming or easy cycling. As you ramp up the intensity, you can still remain “aerobic”: when doing step aerobics orfastjogging, for example, you can still breathe a dequately even though it might be a little more laboured than before. Anaerobic exercise is quite different. Anaerobic means “without air or oxygen”. When your body doesn’t have enough oxygen available to turn glucose into energy, it starts to burn carbohydrates instead. Lacticacidiscreatedas aby-product,and too much of it can make your body feels tiff and crampy. Anaerobic training, such as weightlifting or any kind of sprint training, improves fitness levels much quicker than aerobic training. It is also an important part of becoming stronger and faster. Over time, anaerobic training improves your body’sability to deliver oxygen to your muscles. If you regularly do anaerobic training, you will find that exercises that used to be anaerobic for you eventually become aerobic, and much easier. For example, if running at 12km/h on a treadmill is your top speed and feels like you’re sprinting (with the lack of air in your lungs and the unpleasant ache in your legs), after you do it enough, it will become more comfortable. Soon, 14km/h will feel like sprinting for you. And one day not long after that, you’ll be running at 15km/h. Your speed and general fitness keep increasing through anaerobic training. How you do it: Exercise anaerobically after about 30 seconds of intense exercise, like a sprint session. The lack of oxygen means you can’t exercise anaerobically for more than about two minutes without pausing to recover. Inaspinning class, for example, you will always beguided to take an active recovery (even though it still feels like work) before ramping things up again to a sprint or a hill climb. If you’re training for sprinting, there’s no point spending lots of time jogging long distances – it’s a waste of energy. Similarly, if you are training for a long cycle or swim, there there is no way you can compromise on your long, steady cycle or swim each week. You need to get the kilometres under your belt to complete the distance on the day. Interval training (using short, sharp sprints interspersed with periods of gentler exercise) can raise your fitness without exhausting your muscles by training for hours. Anaerobic exercise should always make up a portion of your training. A mixture of the two types of training is always preferable, but how to strike the right balance is debatable. If your goals are to lose fat and increase strength and fitness, weight training combined with interval training usually gives the fastest results. How to do it: Although you can certainly take care of your heart and lungs by jogging easily around the park, you can do the same with sensible weight training combined with something like kickboxing. That kind of combination will help you shed fat far faster and improve bone density better than steady jogging alone. Whether you’re preparing for an event or just want to stay in shape, your diet is as important as your training. The food you eat fuels your engine. It’s vital to get the correct nutrients to generate energy and promote effective recovery. A balanced diet will also boost your immune function,allowing you to train consistently and effectively. For optimum performance, your diet should include a variety of food from all the major food groups – carbs, protein, dairy,fruits and vegetables, and sugars. 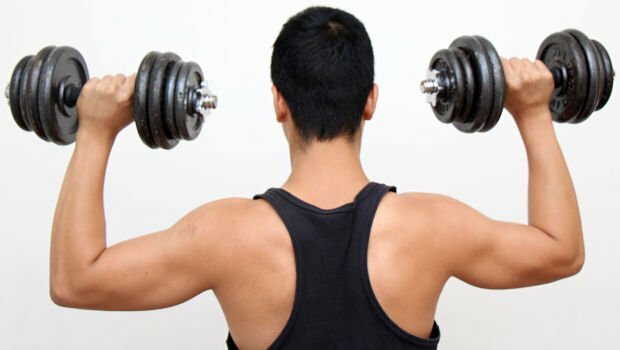 "First of all, I want to apologize to the entire Steemit community for committed plagiarizing on my last posts "Insulin - Builder Of Muscle Mass" and "Should You Exercise When You're Sick?" I used to learn from many croatian articles and now I have decided, unfortunately, from these articles to translate some / all of the sentence, in order to better explain to people. I knew it was wrong but I did not have the motivation to write everything in a way that people will understand the best. I learn from mistakes, this is the only an incentive that in the future I do my best. And I will! It will not happen again! Thank you and my apologies again." Yet here you are plagiarizing an entire article again, not indicating that the content you copy/paste is not your original work could be seen as plagiarism.